KURTZMANN Wherever good pianos were known the Kurtzmann was a prime favorite. This celebrated instrument was available in a magnificent concert grand, a charming parlor grand and a variety of baby grands. It was also made in uprights and upright players and the Kurtzmann line was augmented by the development of a high grade four foot four vertical grand and vertical player grand. This firm was one of the country's oldest piano makers, having been established by Christian Kurtzmann in 1848. The company had steadfastly adhered to the quality ideals of its founder and chosen to grow by adhesion to sound methods of production and merchandising. The Kurtzmann has won a distinct position as a musical instrument of high character. The goal has been to make each Kurtzmann a musical and artistic masterpiece. These pianos usually boast beautiful wood grains which have been hidden for decades. These pianos are valued as well as for their musical capabilities. 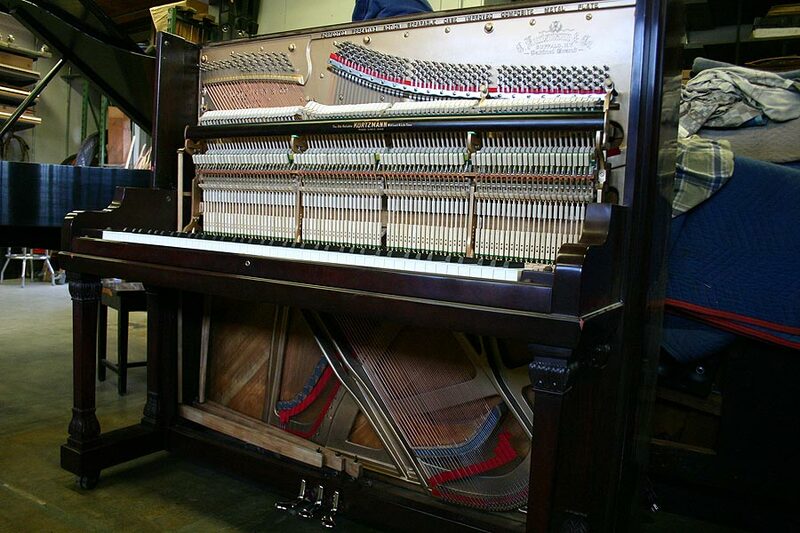 Complete Restoration on 1922 Kurtzmann Cabinet Grand Upright Piano. 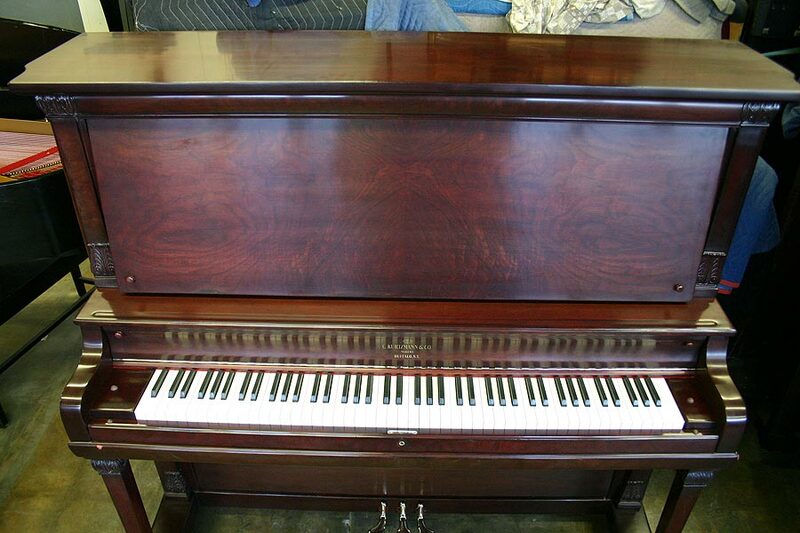 Here is a beautiful example of an early 20th Century, high quality upright grand piano. This piano had been used until all of the key tops had worn off, and the key stick material underneath was ground away. All of the original action components had been repaired numerous times, and suffered from cracks and wood rot. The solution was a set of completely new action components including hammers, shanks, butts, damper levers and heads, wippens, and wippen lifter assemblies. Also included was a brand new key set reproduction that utilized an entirely new key frame. This was a large, heavy piano, and the corresponding tone produced was just as astounding! In excellent condition, (completely restored condition) and with normal wear and tear. This finish is expected for to last sitting in a home for at least another 80 years. Kurtzmann is well known for the beauty of the cabinets and wood, worth refinishing. True craftsmanship is found in even the minutest details, and the Kurtzmann company has long been famed for its skill in the selection and matching of choice mahogany or walnut veneers. Special attention is given to the finishing of Kurtzmann instruments, ample time being taken to assure a finish that like the piano itself, will assure a lifetime of service. This piano was known for its grand piano characteristics, including a robust, resonant bass, rich and warm tenor and a treble with a singing tone, bell-like in its clarity. Many of these instruments were built for use in concert halls, elite hotels, and fine restaurants where their volume and powerful presence was needed. Only the finest private homes could afford to accommodate such a striking and expensive instrument. 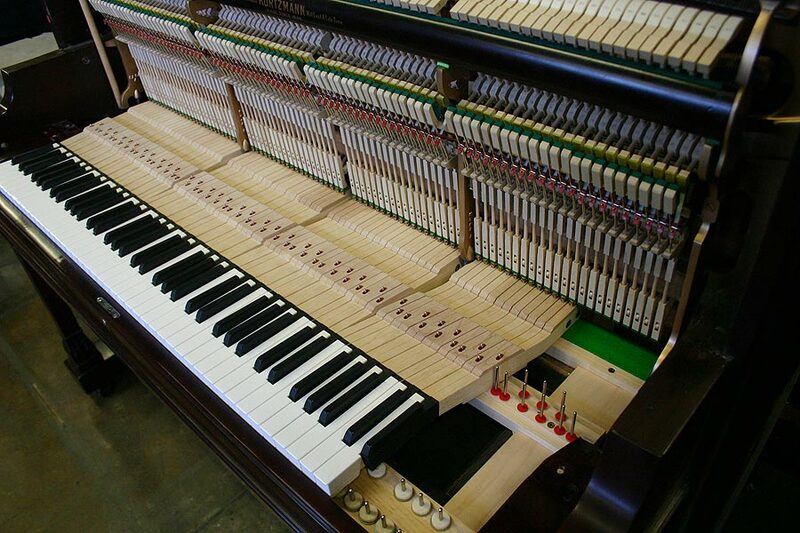 Unique and distinctive features of construction are usually found pianos of the size and description provided. The most important of those special features is the design of the "over- stringing" construction. 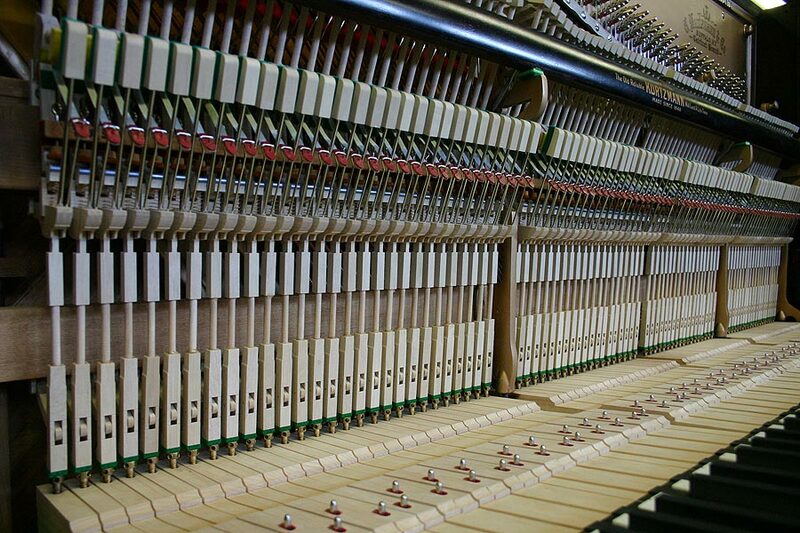 Before 1890 most upright pianos were "straight strung", that is the strings were straight up and down, afterwards the strings were over lapping. This gives this upright longer strings with the tone of a grand piano and makes it especially well adapted for concert use. "Cabinet Grand" is a term usually referring to certain large upright pianos over 50" tall. Due to their towering height, these instruments usually had string lengths and musical capabilities equal and often superior to actual grand pianos, thus being labeled "Cabinet Grand" by their manufactures. A 52" upright provides as much total soundboard area as 7' grand piano. Its #1 bass string's length nearly matches that of a 6'3" grand. In other words, you get grand piano performance quality in a vertical instrument.